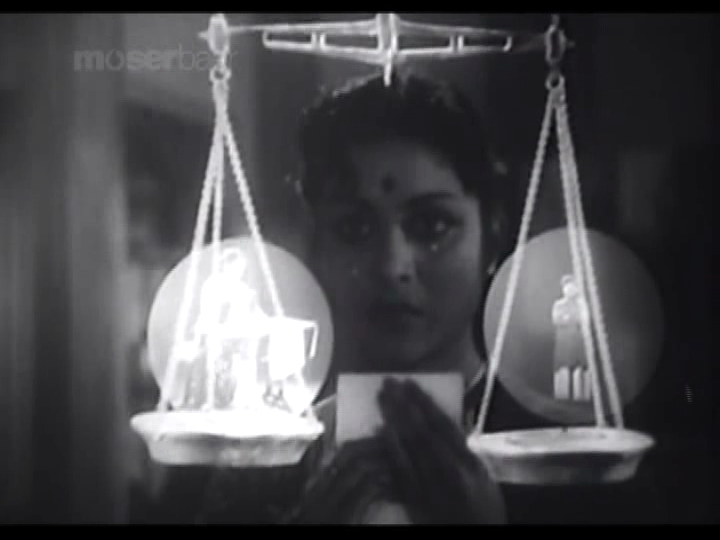 Kalyana Parisu (The Wedding Present) is the 1959 debut film by prominent director C.V. Sridhar. It features Gemini Ganesan, B. Saroja Devi and Vijaykumari in the lead roles but also has notable appearances from Akkineni Nageshwara Rao and K. A. Thangavelu amongst others. While at times the overly dramatic story tends to dip into farce, there is still much to enjoy in this love triangle about 2 sisters who both fall in love with the same man. 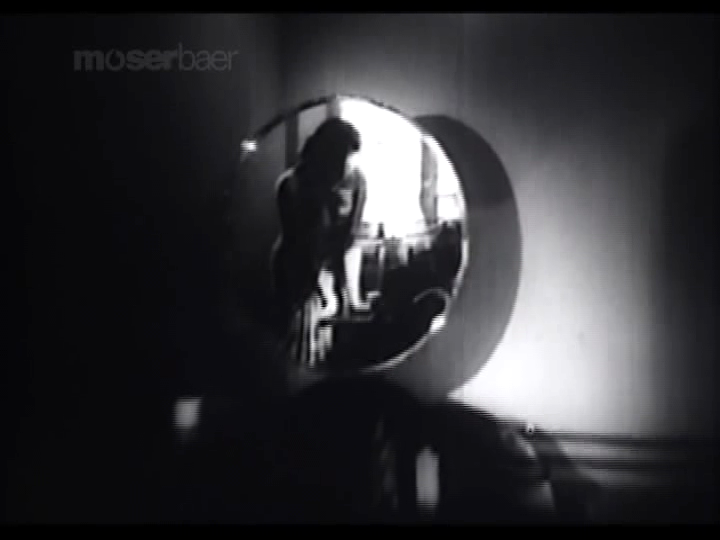 The film opens by introducing the two sisters and their mother who all live together. 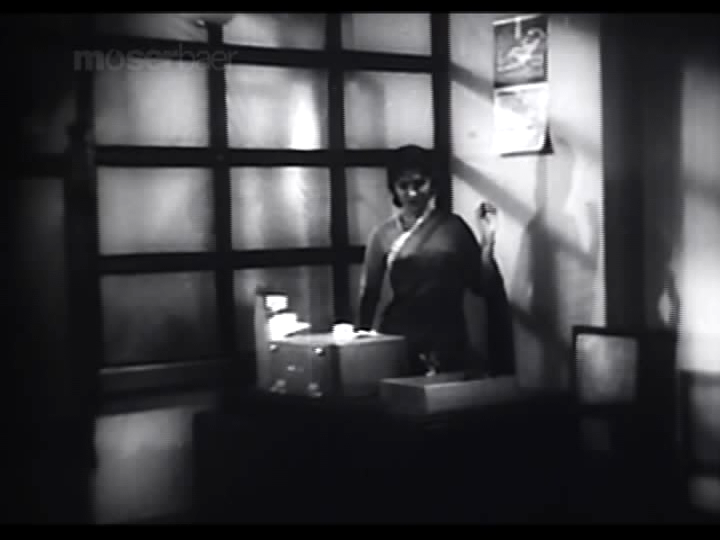 Vasanthi (B. Saroja Devi) is a successful college student and has a sunny and often mischievous disposition. Her elder sister Geeta (Vijaykumari) is more shy and reserved and is the breadwinner of the family through her work as a seamstress. 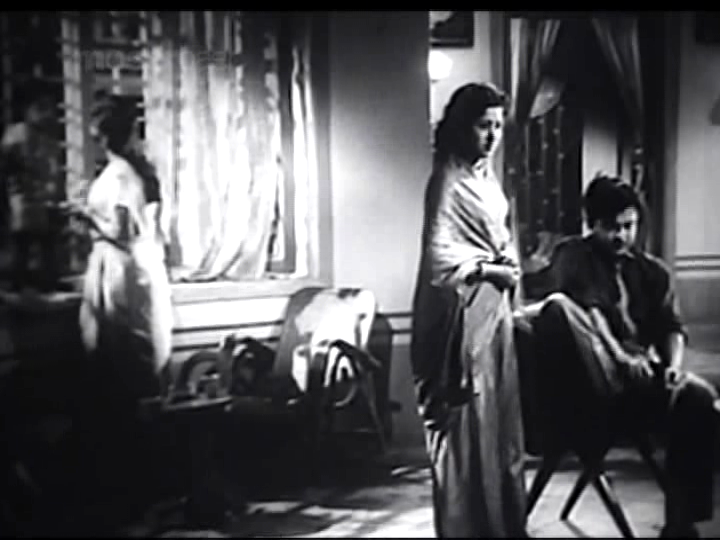 To supplement their income the family decide to rent out the top floor of their house and end up with Bhaskar (Gemini Ganesan) as a lodger. Vasanthi and Bhaskar have some previous history as they were both at college together and the two indulge in some mild flirtation. This soon blossoms into romance and Vasanthi has dreams of marrying Bhaskar just as soon as she can get her elder sister married, that being the natural order of things. However Bhaskar falls ill and in nursing him back to health, Geeta also falls in love with the handsome lodger. Once Vasanthi discovers her sister’s ambition she is thrown into confusion and has to weigh up her Geeta’s sacrifices to ensure Vasanthi could continue her studies against the dream of marrying Bhaskar. After a lot of sighing, chest-heaving and general melodrama, Vasanthi decides to sacrifice her love for her sister and persuades Bhaskar that he should marry Geeta. 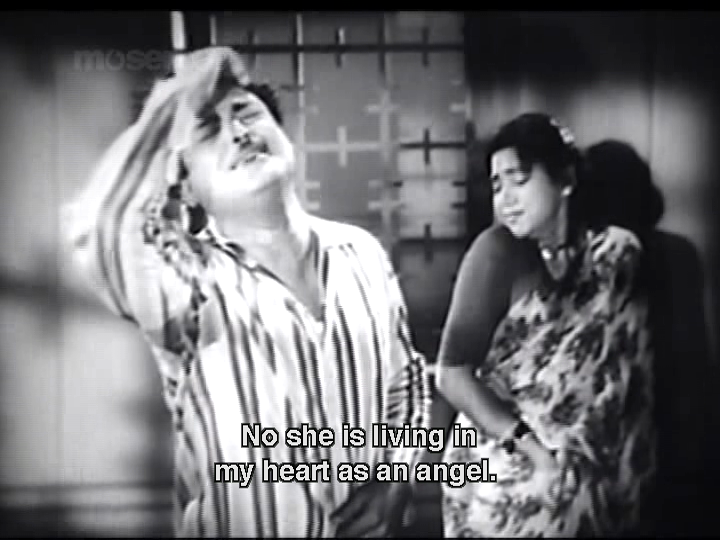 Bhaskar also indulges in yet more sighing, chest heaving and melodrama before finally agreeing to the marriage. Geeta has no idea about her sister’s true feelings and Vasanthi manages to keep her tears under control until the deed is done and the married couple are on their way to Coimbatore. However, as she would have realised if she’d stopped to think about it, all that Vasanthi has managed to do is make three people miserable instead of just one. 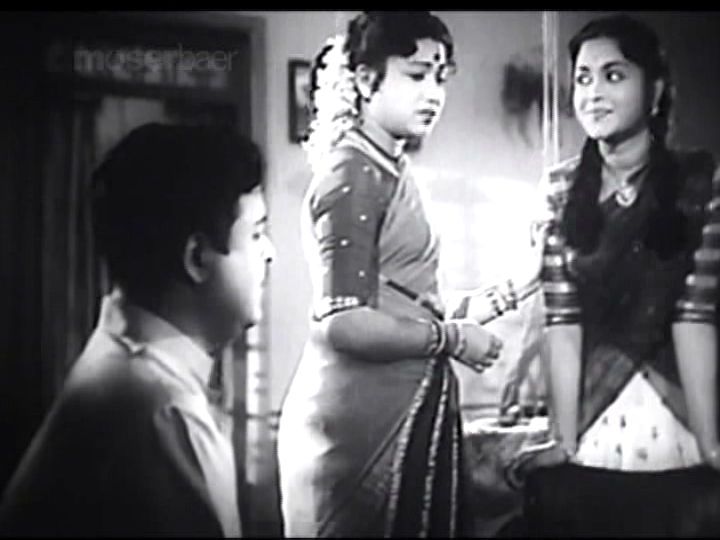 Geeta struggles to cope with a husband whose indifference she cannot understand while Vasanthi tells her suitor Raghu (ANR) that she cannot bring herself to love another man. The situation spirals even more out of control when Vasanthi ends up moving in with the couple and their young son after the death of her mother. Everything just gets more and more melodramatic as the tension between the two sisters’ increases and it becomes obvious that not everyone is going to make it to the end of the movie. Don’t expect a happy ending! The very sweet love story which opens the story is lovely and shows exactly why Gemini Ganesan earned the titles of the King of Romance. Saroja Devi looks absolutely stunning and the two have plenty of on-screen chemistry. But as much as I love a good romance, what really appeals to me about this film is the totally over the top drama and good old fashioned histrionics that everyone indulges in. Once the two sisters are in conflict, every statement and every action have dramatic consequences all of which require much chest heaving and drama queen poses. When Vasanthi walks into a room where Bhaskar is sitting, he stands and moves to pound his head against the wall. 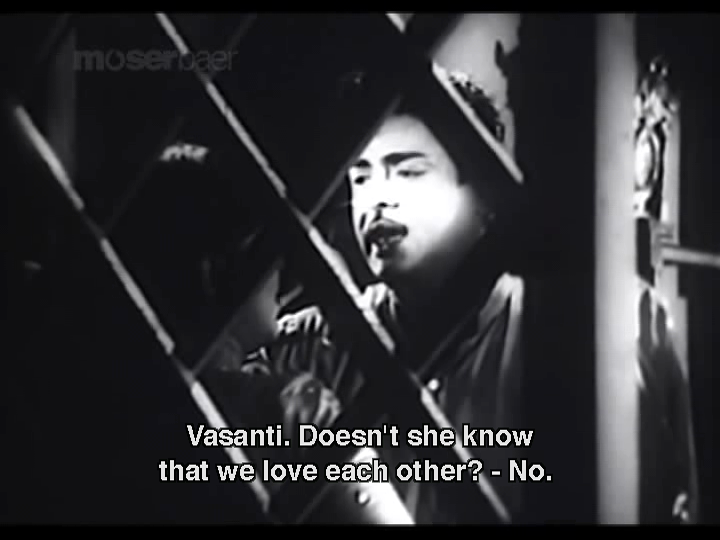 When Vasanthi is reading a letter she reads a line and then pauses to grimace at the camera and clutch her chest in anguish! It’s wonderful and the three main leads make the most of the opportunity to chew the scenery as hard as they possibly can. Rather more unusually, the comedy track is notable for its comparable restraint and both K. A. Thangavelu as Sampath and M. Saroja as his wife Malini provide some quite welcome relief from all the drama. Most of the film is concerned with the relationship between the two sisters and how this changes with the introduction of Bhaskar into the dynamic. 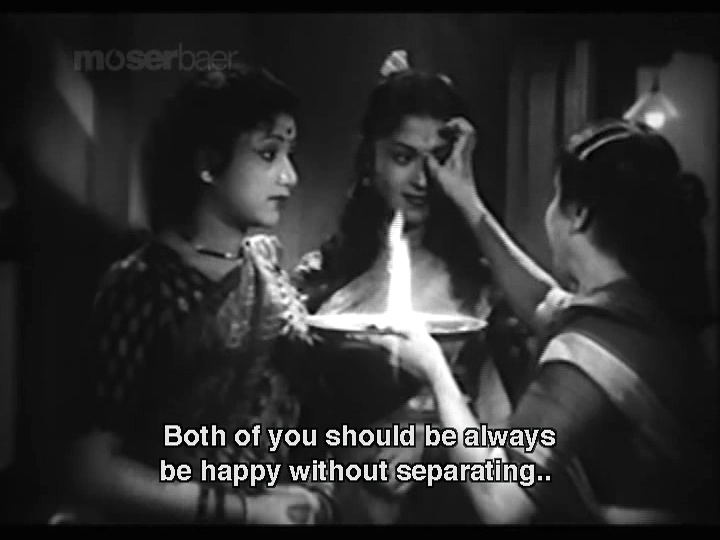 Both Vasanthi and Geeta show great rapport in the early scenes and the gradual erosion of their bond is well portrayed. Although the idea of making such a sacrifice for your sister seems ludicrous to-day, director C. V. Sridhar does his best to show that Vasanthi felt she was making the right decision for a young girl at that time. Geeta’s jealousy and suspicion of her sister is nicely developed and her emotional rollercoaster is almost as wearing for the viewer as it seems to have been for Geeta. 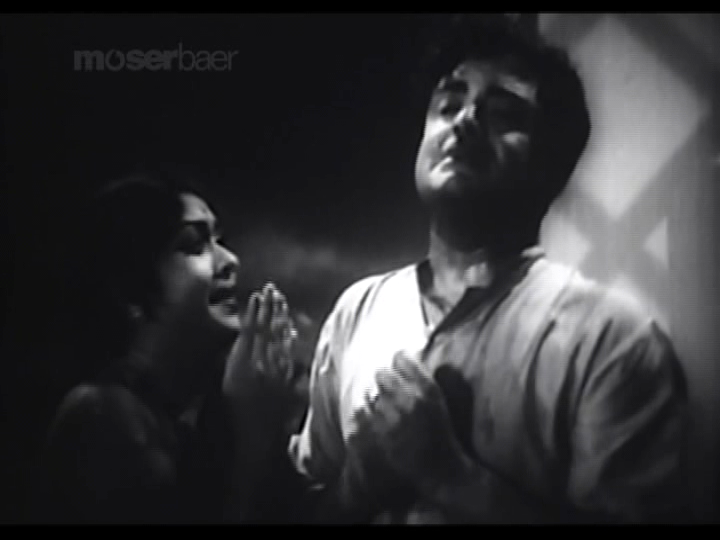 Bhaskar becomes less effective as the conflicted husband as the story goes on as his inability to put aside his feelings for Vasanthi and concentrate on his wife makes him seem rather weak. I do hope that the young child playing the role of Bhaskar and Geeta’s son managed to escape without any longstanding mental scars as he often seemed to be stuck in the middle between some quite realistic shaking and shouting. The film is beautifully shot and it’s a shame that the print has deteriorated in quality making the image difficult to see at times, although that may just be my DVD. C. V. Sridhar uses the shadows and the various shapes made by screens and windows to good effect, often enhancing the oppressive feeling. There is also a significant plant which grows taller as romance blooms but withers away and dies when Bhaskar and Vasanthi break up. I do enjoy the way nature is a stand in for so much in Indian cinema. The music by A.M Rajah is lovely and there are some beautiful songs. One of my favourites is this one which is part of the celebration of Seemandham for Geeta when she goes home to have her baby. Kalyana Parisu was a big hit on its release and certainly gave an indication that C.V. Sridhar would be a director to watch in the future. 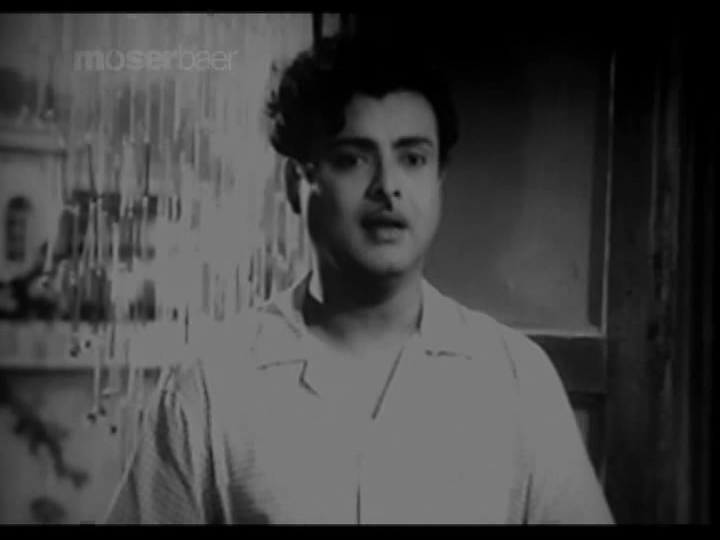 It was remade a number of times by C.V. Sridhar in other languages using a number of the same cast, and ANR took on the role of Bhaskar in the Telegu remake the following year. Nazrana, the Hindi remake starring Raj Kapoor and Vyjayanthimala also starred Gemini Ganesan playing the role of Vasanthi’s potential groom. It’s not a film I would watch again and again, but is one for those days when a slice of melodrama is required. All the lead actors are excellent, slightly excessive histrionics aside, but in particular Kalyana Parisu is worth watching for Saroja Devi who really shines. 4 stars. This entry was posted in Kollywood and tagged A.M. Rajah, Akkineni Nageshwara Rao, ANR, B. Saroja Devi, C V Sridhar, Gemini Ganesan, K.A. 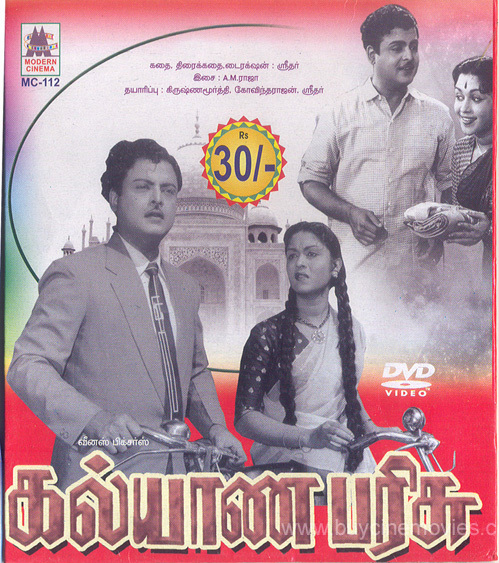 Thangavelu, Kalyana Parisu, M. Saroja, M.N Nambiar, Tamil, Vijaykumari. Bookmark the permalink.